It’s winter in Ohio: twenty-five degrees, a pure tin sky, trees like paused tumbleweed. À la carte moodiness. Each car drags a small cloud around behind it, everywhere it goes, as if we’re all B-league Apollos. It’s a time when writing about anything, especially about art, feels false, a forced truth, whispers from a bitter tongue. And yet. I travel for my job a handful of times a year, out of the breadbasket of Columbus, Ohio, to New York (LaGuardia) mostly; though periodically elsewhere. Port Columbus International Airport (can one not giggle saying that? ), sweet CMH, is a wildly easy place to get through. I have to imagine it’s as easy as airports come—open, big, Midwestern. Nice. Moderately trafficked. To get anywhere on B concourse you have to pass the shine of Honda assembly line offerings: an Accord radiating like a shooting star, a Valkyrie motorcycle with chrome so ample it seems like mirrors forged into the shape of motorcycle, past the competing smells from Ohio institutions Max and Erma’s and Bath and Body Works, and on toward security. No representations of cornfields or soybeans, though both are farmed in large scale in central Ohio and would be appropriate. One does have to deal with what decidedly does not feel Ohioesque just before entering the security swtichbacks—a twenty-five-foot tall sculpture by Roy Lichtenstein, Brushstrokes in Flight. The sculpture has some purchase on this place. Lichtenstein, born in Manhattan, studied art as both an undergrad and graduate at Ohio State, continuing on to work as an instructor. If you don’t hail from central Ohio, this is about as stout a central Ohio pedigree as one can get. A finishing school of sorts for Midwestern undergraduate sensibilities, OSU is the four-year version of cultural submersion that listening to Prairie Home Companion for an hour is on Public Radio. How Lichtenstein managed to be here for so long and yet maintain a significant place in twentieth century modern art is a testament to what I can only assume is a chameleon-like ability to participate in what seem like mutually exclusive cultural milieus. While the mayor was still on his travels to Genoa, Italy, and other stops in Europe, the Dispatch announced that he had given Roy Lichtenstein’s sculpture, “Brushstrokes in Flight,” to the people of Genoa. Uh . . . what? He did what? Mouths all over town fell open as people read their morning papers or listened to the news on the way to work. And hijinks ensued. The art community in Columbus balked and then roared; this was suddenly a work of art invested with latent political capital (Rinehart was a Republican). 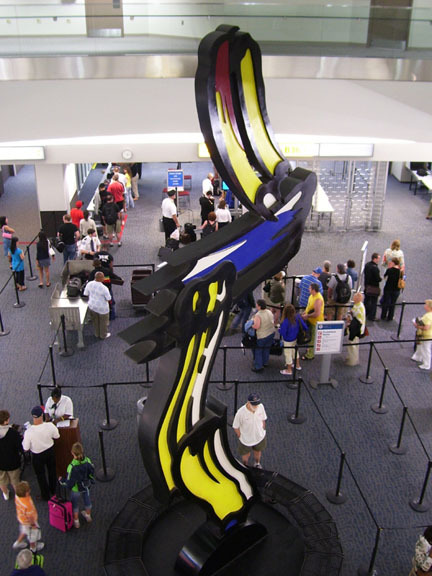 In 1998, the sculpture was moved indoors to its current location, guarding B concourse, like an inscription above a darkened way. But rather than abandon all hope ye who enter here, the sculpture sings something warmer, more playful. And it’s hard not to note this fact: Brushstrokes in Flight is what TSA stares at when they pat you down. It looms. Maybe Ironize all hope, ye who enter here? What to make of a representation representing a representation? Brushstrokes in Flight mimics painting, which represents something else in the first place. A twenty-five-foot-tall aluminum representation of yellow, red, blue, and white paint swipes, the sculpture forces you to think about the consequences of large-scale art. When a physical event sparks an emotional response, our emotions are generally scaled to it. A big dog is usually scarier than a small dog. Finding a dollar and finding a thousand one dollar bills might do different things to your blood pressure. A tiny Guernica has an entirely different politics. Certainly Lichtenstein was interested in Pop Art’s inquisition (and periodic appropriation) of the culture, aesthetics, and physical scale of twentieth century American marketing culture. In another sense, looking at Brushstrokes feels like you’re being forced to take the long way, a roundabout, a circumlocution for what might be more plainly or directly rendered. The engineering part of your brain (the part that manages to assemble furniture and figure out new computer programs) might find Brushstrokes inefficient. It is, perhaps, a hoodwinking—as in: Welcome to Port Columbus, fair traveler. Here’s your first detour. But that is not what we are here-for really. The once-for-all that is not seen, nor said? Art’s compromise—the representing it is doing (and therefore, the bastardizing it is doing, inherent in the act of representation) is the problem, the riddle we as audience solve, and one through which we might get a fleeting glimpse of the possibilities of a particular art experience. The compromise is an act of creation. How to make the “compromise refer // to what could not be otherwise instead / and has for being as its own to be”? How can an artwork be anything other than what it is? Comprised of the starkest stuff, these opening lines of Auden’s poem pose the problem of any art experience that plays with our emotions. How does one talk about the experience? How to use words, the right words to articulate? Where a blank I loves blankly a blank You? So art (insofar as a circumlocution is a metaphor for art) assumes the trickery of ritual and the burden of faith, transmitted through the emotion it generates. The artifice of representation is the reminder of ourselves at our least apt, least kind, least true. The poem suggests that an art experience can be like pressing a bruise on the imagination at the same time it makes imagination possible—it’s a reminder: don’t forget who you are, oh swashbuckling you. It’s a brutal whisper in your ears: here are your tethers. Way-finders, those who travel, those who are between places, those busy taking the long way around—here’s a way to locate. For better or worse, YOU ARE HERE. And yet, an update, per Lichtenstein, via Auden: You are not here. For its rambunctious circumlocutions (that bold color! ), Brushstrokes feels like an invitation to play, in spite of oneself. Brushstrokes is the fiddle player practicing dance tunes for a wake. It’s a township worker mowing the county’s ditches who imagines for a moment that the roadside tiger lilies are orange juice popping in a hot skillet. It’s a chance to pay attention, and imagine for a second, while we can. It’s a blank I loving a blank You, anyway, regardless, in spite of it all. As I pass in and out of B concourse—there it is, full of suspended kinetic energy, taunting gravity; a paint swipe without a canvas like an angel without sky; some tomfoolery before the seriousness of the metal detector, out of context. I like Brushstrokes in Flight for all that it could be: here’s what a cup full of paint looks like falling to the ground when the man next to you bumps it during an animated, Ohio-volumed, overly personal Blackberry conversation; here’s an abstraction of any beautiful Ohio summer sunset, weirdly most striking from the parking lots of Walmarts and Home Depots; here’s what color looks like when it gets the spirit; here’s the logo on the shirt of a middle school soccer player on a team called the Lightning Bolts, after running through a blackberry patch. Brushstrokes could literally be anything, which means that everything is absolutely, beautifully germane, absolutely relevant. You are here and not here. How at this moment, it is an answer, the answer to all of these questions: Why on earth are you looking for something beautiful outside a Walmart? Why do balls always get lost in the blackberries? Why is color spirit? What are you doing standing in an airport holding a cup full of paint? Tyler Meier’s poems have appeared or are forthcoming in AGNI (online), Bat City Review, Forklift, Ohio, Indiana Review, jubilat, Thermos, and Washington Square Review. He works as managing editor of The Kenyon Review and co-directs KR’s Young Writers Program, a summer writing workshop for high schools students. He lives in Columbus, Ohio. All language becomes an alphabet of sites, or it becomes what we will call the air terminal between Dallas and Fort Worth. Catastrophe, eyewear, and the phrase “cloud computing”—this “twenty-first” century contains the gimcracks and jetsam of previous notions of the future. We are rising into the ruins of twenty centuries’ worth of fantasies of wellness, health, wealth, progress, equality, perfectibility, communication. Emerging from this rhetoric of failure, then, is a rhetoric of the hidden, the occult. The future may be lost “somewhere in the dumps,” but this makes the dumps themselves the sites of the future, the sites of Art. The role of artists is to act as media on these sites: “One does not impose, but rather exposes the site—be it interior or exterior. Interiors may be treated as exteriors or vice versa. The unknown areas of sites can best be explored by artists.”iv Entropy only runs one way, but the deathlessness, falseness, jejune-ness of these sites remarks them as spaces of irrational, unstable occult possibility. Interiors may be treated as exteriors and artists are possessed by media; without the need for photographic equipment, light, or chemicals, they themselves make exposures. Art brings the infinite into finite things. A terminal that does not terminate. An interminable terminal. A termite terminal. Infested with Art. 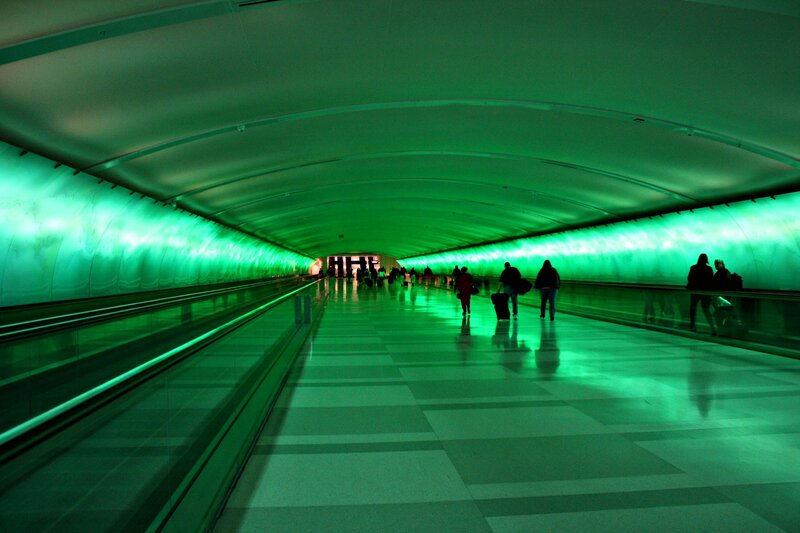 The Light Tunnel running between terminal A and terminals B and C in the Detroit airport is meant to serve a utilitarian purpose—to move passengers among terminals while distracting them with a light show. Yet its entropic productions place it in excess of this functionality. The light, music, and motion in the tunnel means it is not static, yet cannot productively advance; it is between—permanently between. Like Smithson’s “terminal between Dallas and Fort Worth,” it is a terminal that does not terminate but is a medium (another paradox). It exposes this by making itself medial in every direction—by bringing body after body into its conveyance (and ejecting these), by throwing nervy lightstorms up its walls, by emitting screeching and smears of music which emanate no-place and fill up everyplace, welling and draining. The passenger (one wants to write “prisoner”) passes through the tunnel, but without agency; she is immobilized, a victim to Art, at first one of its materials (a body passively put in motion) and soon one of its media. That is, the Light Tunnel itself is antic and contagious (“stupid and contagious,” to quote the poet); the tunnel features a button which may be pressed by passengers prone to seizures to “turn off” the light effect for the five minutes it takes to move through it.vi The pain thus leaps from the Art to the passenger (Art’s passenger), creating a spasming counter-movement to the would-be utilitarian linearity of passage through a tunnel. The non-seizure-prone passenger still experiences a transfer of nerve signals both continuous with and formally mimetic of the light and music breaking all around her, irritating the walls. Here, then is a work of Art that does not transcend but merely transmits. It brings the infinite into finite things—but not vice versa. It is a surfeit, an oversaturation. Art is in transit, transmits, transfers, appears ill, transfers an illness to the humans who pass through it as material and become its medium. As in Smithson’s treatment of Corman, the Light Tunnel “shows us the peripheral shell of appearances in terms of some invisible set of rules, rather than by any ‘natural’ or ‘realistic’ inner motivation.” Nothing motivates the Light Tunnel; the passengers that pass through it might even be the irritants that set off this irritating spectacle in its tissue. And like Corman’s actors, these passengers “reflect the empty center.” They are themselves unmotivated, “appear vacant and transparent, more like robots than people—they simply move through a series of settings and places and define where they are by the artifice that surrounds them.”vii The passengers, Art’s passengers, Art’s patients, Art’s prisoners, are Undead—but, like the Undead, they are irritated, as they rise like an army into the century’s ruinous light. i “A Tour of the Monuments of Passaic, New Jersey.” Robert Smithson: The Collected Writings. Berkeley: U. of California Press, 1996. 72.
ii “A Museum of Language in the Vicinity of Art” (1968), Collected, 91.
iii “A Tour of the Monuments of Passaic, New Jersey.” (1967). Collected, 74.
iv “A Thing is a Hole in a Thing it is Not.” (1968). Collected, 96.
viOr so claims Wikipedia (http://en.wikipedia.org/wiki/Detroit_Metropolitan_Wayne_County_Airport); I’ve never seen this button despite the many, many times I’ve endured the tunnel, so I imagine seizures are rampant. vii “A Thing is a Hole in a Thing it is Not.” 90. Joyelle McSweeney is the author of two hybrid novels—the baroque noir Nylund, the Sarcographer (Tarpaulin Sky) and the sci-fi Flet (Fence Books)—as well as two books of poetry from Fence. She teaches at the University of Notre Dame, co-edits the small press Action Books, and contributes to the multi-authored blog, montevidayo.com. Her next book, Percussion Grenade: Poems and Plays, is forthcoming from Fence in 2012.